Nellie was my first goldfish. Anyway. Our story starts on April 21, 2016. My sophomore year of college. To raise money for a local philanthropy, a campus club decided to sponsor the “Fishy 500,” a fish race. Participants paid a fee, squirted fish with tiny water guns to spur them to swim through a 10-foot track, then got to walk away with the satisfaction of having helped abused children as well as the subjects of their mild waterboarding. Which is how I ended up paying $10 for a fish that costs 34 cents at PetSmart. I named her after Nellie Bly, who pioneered investigative journalism, but is now mostly remembered for her “stunt work,” most famously traveling around the world in 72 days, beating the fictious record set in the book Around the World in 80 Days. I had no idea how ironic all of this would be. So, I bought a large piece of Tupperware from Dollar Tree, and that was Nellie’s home, except for a few short stints in a Mason jar, pickle jar, and salsa container. You think that’s rough? Just wait. Between my sophomore and junior year, I lived in three different states. Ergo, so did Nellie. That summer, we packed our bags (and Nellie’s Tupperware container) and scampered between Tennessee (where I went to college), Florida (where my family lives), and Alabama (where I interned). As we toodled across state lines, Nellie bobbed along in a pink cup sandwiched between me, singing along to some Broadway soundtrack for x hours, and a passenger seat littered with mostly empty water bottles, my shoes, purse, and who even knows what else. Over the course of many trips, she had a few tumbles but always survived. She was basically the aquatic version of Jason Bourne. The journalist Nellie Bly once feigned insanity to write an expose about the brutality and neglect of mental institution. I’m sure my Nellie longed for the sanity of an 1887 loony bin. Anyway, when summer ended, the traveling ground to a halt as I slogged through the fall semester of junior year. Then we hit December. As a single fish parent, this posed a dilemma. I always flew back to Florida for Christmas break. At the time, I was not well-versed in the TSA policy on fish. After diving into parts of the TSA website that no one who wasn’t planning a low-scale terrorist attack has ever looked before, I concluded that I could probably bring Nellie. But I wasn’t sure, and I didn’t want to take any chances with my little golden-scaled traveling buddy. When I flew home, I always parked my car at a family friend’s house in Nashville to avoid spending a small fortune for airport parking. So, rather than run the risk of some dour muscle in a bulletproof vest confiscating Nellie, I asked my friends to keep her. That poor woman prayed over Nellie every single day, and on January 2, 2017, when my plane finally landed at the Nashville airport – after a five-hour delay – and I lugged my duffel bag off the suitcase carousel, my car and Nellie were both shiny and sleek and ready to go. By the end of the night, we would all be in varying degrees of ragged. My plane took off late because of foul weather in Nashville. As I navigated the roads to Jackson, Tennessee, it was still raining steadily. To make things worse, there are no lights along I-40. But I had a podcasting class the next day, so I zipped through the dark, listening to the Hairspray soundtrack. About an hour later, I felt the wheel turning itself to the left. Before I could react, my car smashed into the guardrail. Then it bounced off and veered to the right like a tiny metal ball in a pinball machine, slamming into guardrail on the other side. Anyway, after bashing both sides of the car, I managed to get control and pulled over to the side of the road. Turning on the emergency lights, I yanked open the car door. My bare feet sunk into the mud, rain sopped my clothes. I stood back and tried to assess the damage, but I couldn’t make anything out through the rain. Cold and wet, I crawled back into the car and called the police. When I hung up, it hit me – where’s Nellie? Her cup had rolled under the passenger seat. We never found Nellie’s body. Every time I tell this story people are like, “That’s the funniest and saddest story I ever heard.” And it’s true. And even though it hurt in the moment, looking back, I have to say, I couldn’t imagine Nellie dying any other way. So, why write about this now, more than a year and a half later? Grieving is a process, and it took me time to work through it. For the last nineteen months, I’ve wondered if I have the capacity to give a goldfish the care it needs and deserves. A couple weeks ago, after writing about how Nellie weirdly helped me get my job, I decided it was time to move on. I was ready to open my heart again. Life happens. Fish die, cars wreck, screws fall out. The world is an imperfect place. After a week of research and visiting pet stores, I screwed up the courage to buy another goldfish. Sometimes, you just have to get back on the horse. Or put another fish in the bowl. Or the cupholder of my car, which is where my new fish ended up the very next Saturday afternoon as I drove from my apartment to my parents’ house, an hour away. Amazing how, in spite of all our best intentions, we end up making the same mistakes. Well, hopefully not all of them. If anyone was wondering, I named my new fish “Nora” after Nora Ephron, who co-wrote and directed my favorite movie, You’ve Got Mail. So, I’m naming my fish after women writers now. Cliché? Maybe. But at least I’m not using them as a mini SPCA commercial. In memory of Nellie. I hope that Heaven is a full-sized aquarium full of friends, where you can traverse the entire galaxy without the constraints of a Tupperware container. If you’re reading this and not completely repulsed by my negligent fish ownership, type your email into the “Stick Around” widget on the top right of the screen. “Sure thing! I’d be happy to!” I chirped before turning back to my Post-It note-covered desk, thinking, how on earth am I supposed to explain fluking my way into this job? “Hey Mom, there’s that company I’m never going to work for.” I pointed at a logo along the Rays outfield fence. Mom gave me a tightlipped smile. I think it only hit her that year that her daughter would be graduating from college with two majors – one in journalism and one in creative writing. To borrow a joke that I’ve only heard a thousand times, that means I didn’t learn anything in college, except how to communicate that very clearly. And I had just blown my one chance for a well-paying summer internship. For one thing, I didn’t learn about it until after the application deadline had passed, so my application was late. Plus, confused by the mad juggle of summer internship applications, I sent in the wrong cover letter, so the first paragraph explained how deeply I wanted to work for another company. Not surprisingly, they never contacted me, so I was pretty confident when we went to a Rays/Blue Jays game during spring break my junior year that I would never work for the company whose logo I had just laughed at. I think we all know where this is going. Fast forwarding, the girl who did get the internship dropped out, so they gave me a call and asked me to resubmit my resume and cover letter. After that, I had a couple interviews with an HR rep and one with a communications manager, featuring my well-rehearsed spiel on how a creative writing major actually teaches valuable skills (most notably, how to think of arguments for why creative writing isn’t a useless major), and for a little bit of personal flavor, I also sprinkled in the story of how I accidentally killed my goldfish in a car accident. In a shocking turn of events, they decided to hire me as the corporate communications intern. Considering the fact that when I showed up for my first day, everyone in the office already knew the story of my late goldfish, I can only assume that somehow clinched it for me. Through no fault of my boss, I really didn’t know what I was doing the entire time. But I read once that one of the reasons Ronald Reagan managed to inspire people was because any time someone asked him a question, he would sit up straight, smile, and say, “I’m so glad you asked that question,” even if he had no idea what to say after that. So, I decided to try that little presidential fake-it-till-you-make-it policy. My boss would ask me to do something, I would give a cheery affirmation, then I’d go to my desk and quietly sweat. The second semester of my senior year of college, my boss emailed me to say that they wanted to hire me; all I had to do was submit my resume and cover letter. As I uploaded my resume and cover letter, onto my account on the employee portal, I noticed something – when applying for the internship, I had uploaded the wrong cover letter the second time, too. Error 404: brain not found. On my first day after graduation, I showed up at the office sporting a new ID badge with an employee picture that was somehow worse than my intern photo (although at least they spelled my name correctly this time). My supervisor showed me my cubicle, introduced me to my new team members, and then we went out to lunch. After explaining how I’ve spent the last year-and-a-half debating whether I have the time and resources to give a fish the care it deserves, I turned to tell the story to the new hires and learned that they had already heard about my poor goldfish. The only bad publicity is no publicity, right? Last Wednesday was my one-month anniversary as a full-time employee. To celebrate (or maybe coincidentally), the company gave us free baseball tickets and a half-day. Lounging on the Tropicana Field party patio with my coworkers – right next to the logo I had pointed out to my mom about a year ago – it really hit me how inexplicably everything had come full circle. Public seminars are a $400-500 million industry. We read self-help books on setting goals, watch TED talks on exuding confidence through power poses, and paste together motivational vision boards. We all want to know the ten steps to success or how to improve your life in just five days. But sometimes we don’t get an instruction manual. Life doesn’t always operate in a linear, logical way. It’s messy and imperfect and sometimes there’s no single magic key that unlocks success. Maybe we really don’t have control over what happens in our lives. I guess all we can do is have a good attitude, do our best, and trust God to work everything out in the end. And maybe have a killer fish story. Premise: Weddings are freaking nightmares. Yes, we’ve seen all the movies. My Big Fat Greek Wedding taught us that true love can withstand even a tightknit family. Seven Brides for Seven Brothers taught us that the best way to get a woman is to kidnap her and cause an avalanche so she would have nowhere to go if she did escape. The Princess Bride gave us the most iconic line in the history of romantic cinema: “Mawwiage is what bwings us togewah today,” which is such a great line because you can use it for any occasion – graduations, birthdays, funerals… But whether it takes standing outside the girl’s window blasting a boombox or riding into the a sunset on a lawnmower, they always get their happily-ever-after. I’m talking about real-life weddings in the late 2010s. Point 1: Dresses are expensive. In high school, I bought all of my formal dresses at one of two places: Goodwill or Salvation Army. I think the most expensive one set me (read: my mom) back $40. (That may seem tacky, but to be fair, the only dance I ever went to was the Governor’s Ball hosted by a statewide government club and held inside the Tallahassee Antique Car Museum. Every year, I took a photo next to the Batmobile and a display case of pocketknives.) In college, on the rare occasion I attended some fancy soiree, I usually borrowed a dress from one of my sorority sisters. Well, now, I’ve graduated college. I’m a 22-year-old working as a corporate communications coordinator in St. Petersburg, Florida, so the odds that I will invited to the Met Ball Gala – or any gala, ball, promenade, sock hop, or disco, for that matter – is extremely slim. Some would say nonexistent, but I’m still holding out hope that I will one day run into Dan Stevens, and he will realize that we are meant to be together. But unless – or until (Simon Sinek says positive thinking is the only way to achieve your goals) – that happy day comes, I will never have an excuse to wear a fancy ball gown again in my life, ever. So not only does that mean that I already have two floor-length dresses that cost upwards of $250 hanging up in a closet in my parents’ house, but, if I were ever to have a wedding, I would (easily) be spending upwards of $1,000 on a dress designed for me to wear only once in my entire life. Call me a Goodwill-hunting pack rat, but I honestly cannot wrap my head around that. Point 2: Pre-wedding hoopla is insane. The first time I was a bridesmaid, I twisted the combination of my school mailbox, opened the metal door (probably on the third try), and invitations to five wedding showers fell out. Five. For the same girl. Now, I don’t think she reads this blog, but in case she ever does, I want her to know that I don’t judge her; I know that she didn’t plan them. And, to be fair, she had just graduated college and was working at Starbucks until her wedding. But as an introvert with a full-time job, I can’t imagine doing a bunch of pre-wedding shindigs. And it’s not just the showers. Proposals have to be such an elaborate affair – emotional and intimate (but with a photographer close enough to capture everything) – plus a surprise engagement party with family, friends, balloons, cake, and a photo booth (pics or it didn’t happen). It is such sentimental rigmarole. Whatever happened to the days where a man just offered the girl’s father a goat? When did we decide we needed to bring pageantry and romance into this transaction? And it isn’t just the future bride who gets proposed to anymore. 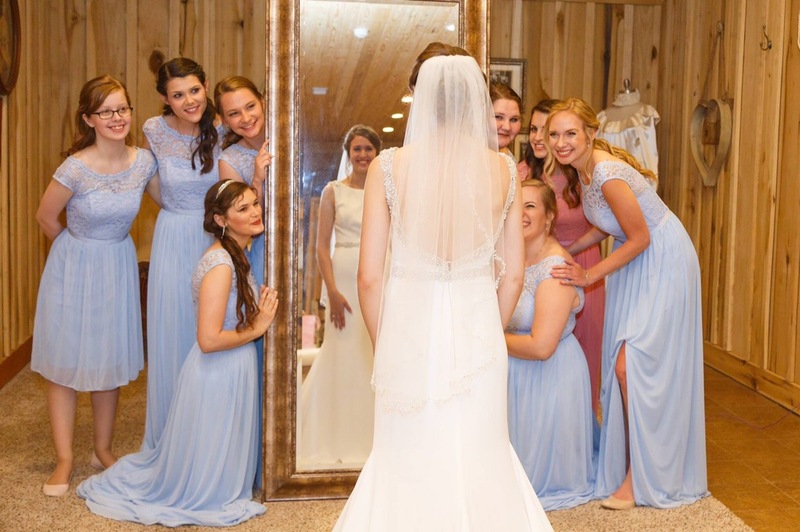 Now there’s “bridesposing.” This is when the bride-to-be woos her friends into being her bridesmaids by presenting them with a small gift, typically jewelry. Literally. It’s proposing to your friends. Listen, we lived together three years, I never learned what type of underwear you like, and I don’t want to know now. Point 4: The ceremony is just a freak sideshow in the social media circus. I already mentioned the engagement brouhaha. So, let’s talk about the big day. Conclusion: Let’s just get away. Beneath all the Pinterest-inspired table settings, when photos are sucking at every gigabyte of phone memory and the send-off sparklers are nothing but ashy metal sticks, the important part of the wedding is that two people have vowed to love, honor, and cherish each other for the rest of their lives. I understand that it’s an important day, but in the grand scheme of things, it is one day. All that to say, I’d rather save money for the honeymoon, so we can go somewhere exotic and start our life together with amazing memories and peeling, sunburned shoulders. So if I ever get married, I’m going to elope. But not in an unplanned, harum-scarum, run-baby-run, kinda way. (Hello, it’s me.) We will be organized and logical about this. We’ll make travel reservations and toodle down to the courthouse on a pre-arranged date. Heck. Maybe it’ll even be an excuse to wear one of those bridesmaid dresses again. Sounds like happily-ever-after to me. Do you hate weddings? Does emotion make you snarky? I think we’ll get along just fine. Click the “Follow Me” button or type your email address into the widget on the top right of the screen! It wasn’t anything dramatic, I just didn’t know where to put my keys. “I’m going to try not to be sad,” Mom had told me about an hour ago. And to her credit, Dad did not have to physically pry her clinging arms off me and lead her away like he did when they dropped me off at college for the first time. We hugged, said goodbye, and then I left. As I backed out of our driveway, the sun crept down toward the Alafia river. I had planned to leave earlier, but the rain delayed me. The next day, I would start my first post-grad job as communications coordinator at a product solutions company. The sky shone pale yellow, tires kicked up clouds of pale of daffodil-colored mist as I drove to my new apartment. It was only an hour from home; no big deal, I told myself. Until I unlocked my apartment door and walked in, keys jangling as they swung from the fob around my wrist, and I realized I didn’t know where to put them. It’s one of those small, daily rituals, so routine you don’t even think about it until you walk into a new apartment, walls smooth and blank as an eggshell, and realize that you don’t know where to put your keys, hang up your purse, or plug in your phone, and there’s no one to tell you. There was only one familiar item within 400 square feet: my bed. I’ve had the same bed for as long as I can remember: a full-size with a white coverlet embroidered with a floral pattern. When I was in elementary school, the bed ran diagonal to the far right corner of my room, meaning the headboard and two sides of the yellow walls formed a triangle just the right size for an 8-year-old kid. I used to drop behind the headboard and write on it with my “spy pen.” You couldn’t see the ink unless you cast the purple light on the other side of the pen over it. I like to imagine that the ink is still there, that if I bought a blacklight and shone it on the smooth white boards, childish scribblings would appear, glowing pale purple, like futuristic hieroglyphics. I used to like leaving words around. I can’t remember how, but I somehow managed to chisel the word “detectiev” (“detective” – I could never remember how to spell it) into my desk in fine, pointed letters. “Cat” was penciled onto the baseboards. And I guess I still like to leave words all over the place…although now I generally use pens or my laptop and leave the furniture alone. On the walls of my college dorm, I hung prints of our college magazine layouts – the cover of my first magazine as editor-in-chief, stories I wrote, dummy copies with mistakes circled in pink pen. Growing up, I never hung pictures of pop stars or movie posters in my room. They always seemed confrontational – hands on hips, looking flamboyantly into the distance against obtrusive gusts of wind. They never invited me to get to know them. They never offered to tell me a story. Realizing I couldn’t just stand in my kitchen all night, I stuck my keys in my purse, which I hung from the bedpost, next to my invisible scrawls. The next morning, I covered the walls with magazine pages. And I planted my Baby Groot chia pet. A 20-something-year-old writer living in Tampa Bay. If I ever make it in the history books, it will probably be as the first person thrown in federal prison for excessive library fines.